Skyscraper is a disappointment. The film makes one of ultimate sins of movies with a hot take of a premise: it doesn’t commit to the crazy of the premise. Despite a building 5 times the size of the iconic Nakatomi Plaza of the easy-to-compare-with Die Hard; this is ultimately a small film. Two-hundred and twenty stories: about ten people at most are around. (In one of many signs of bad editing, the amount of people surrounding mogul builder Chin Han changes each time it cuts to him). The majority of the action sequences are minor beats, far from thrilling and, as noted above, poorly edited. Yes, there is THAT sequence; the one in the much laughed-at poster. 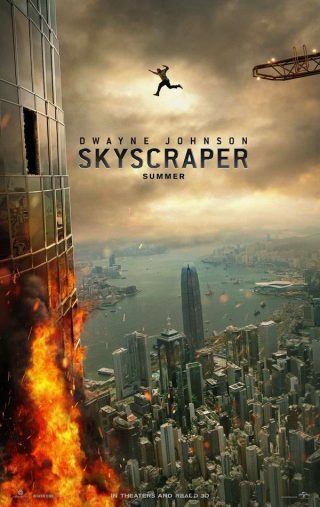 Where hero Dwayne Johnson jumps from a construction crane into the titular building. It’s the high point, it’s well done and decently well-made; but also feels like the film is based around a poster someone made. 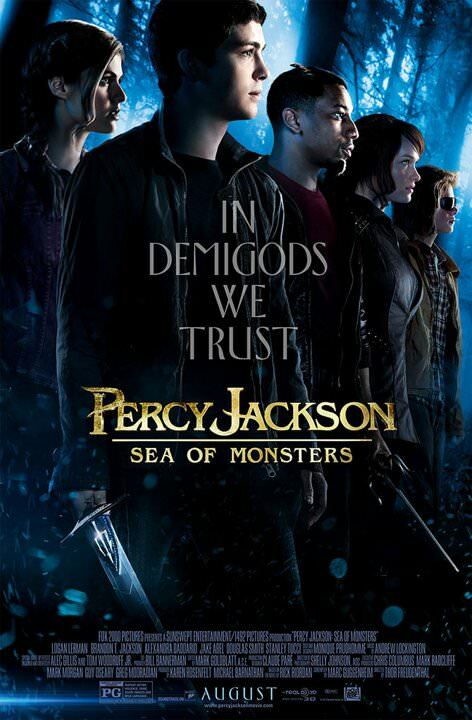 Thus, the film is contrived to a fault. “Okay, we need to get the Rock to jump into the skyscraper…. How… okay, let’s make him have to visit an off site location when it all goes down…” Why would he need to leave? Johnson is a security expert, hired to check on the safety of the world’s new tallest building. He’s bad at it. Oh Bowie, he’s bad at his job, like I’m damned sure he signed off on Jurassic Park’s security system bad. He’s the only one on his team and the slightest bit of hacking brings the whole thing down. Stupid contrivances are expected for films, I know. But there is a point where enough people make enough stupid decisions; that one that just takes it too far. Whether it be stupidly splitting up, choosing to take a certain action, or even a reveal of a needed object in a dangerous location just to have an action scene. This can be fine, if the action around it warrants it. Too bad Skyscraper’s is filler fight in network action show level. It doesn’t help there really isn’t any interesting character to keep things moving, especially the villain. I can tell you his name is Botha, as imdb.com told me he has 4 thugs; but in an oddly written page, he’s not listed, nor are the first three thugs. Here’s how bland he is – we see him multiple times before we realize he’s the main villain. Dude seems like one of the hired thugs. It doesn’t help we’re given no proper introduction; although characters reference him like we’re supposed to know who he is. As for the rest, The Rock brought his family to the building with him, allowing a welcome return for Neve Campbell to the screen. She comes with two annoying kids. She also comes with the groan-worthy aspect of being a white woman ready to solve the issues the Chinese police can’t solve… multiple times. 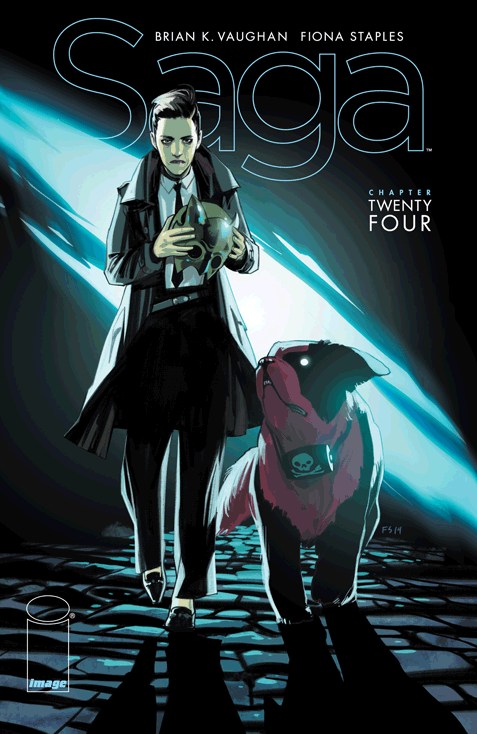 Saga #24, this is simply amazing.